A new style of kitchen trends is emerging and taking over the design scene. Blue Tea is naming this movement the modern farm-style kitchen, and we think it’s going to be a winner. A modern farm style kitchen is both casual and cosy, sophisticated and inviting. A modern farm-style kitchen infuses elements of the past with the clean lines and minimalism of today’s lifestyle. It is the type of warm space you yearn to have a cup of tea in, but also one that you can pull your laptop out and get down to business with its uncluttered approach to design. Below are four main style guides that define the elements of a farm-style kitchen. V-groove panels paired with a chunky bench top is just the right look for your modern farm-style kitchen. Understated, raw and modern, with reference to our past, v-groove panels add depth and cosiness to your new kitchen. A V-groove panel refers to the v-groove recesses that are visible on the face of the panel. Historically, this style was created by aligning individual board panels, and fixing them together. These days, the V-groove pattern is simply routed into a flat door, giving the illusion of an actual V-groove butted panel. This style pays homage to the revival of the traditional handicrafts movement. It takes the edge off a modern kitchen that is often too flat, shiny and crisp. Paired with a solid bench top, it creates the perfect modern farm-style kitchen. It is the right balance of a minimal and modern approach to design paired with historical references. Below are some examples of kitchens showcasing these elements. 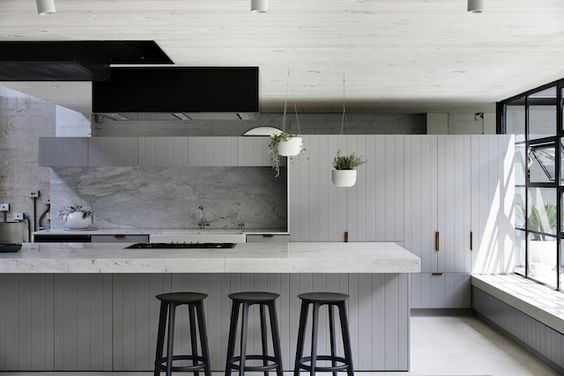 This kitchen above is designed by Jane Cameron Architects in Melbourne. It showcases striking V-groove panelled wall to ceiling doors in a dusty navy colour. It is contrasted with solid, chunky bench tops in concrete. The look is both minimal and rustic. 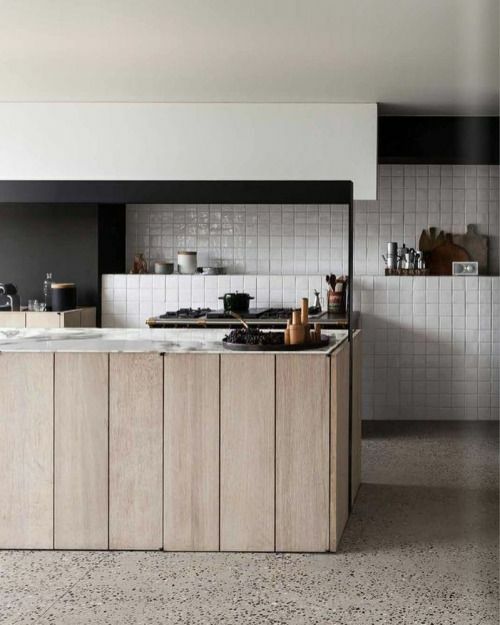 Another kitchen in Melbourne, this one is designed by Madeline Blanchfield Architects. Minimal V-groove doors in light grey seem to be suspended in the space. 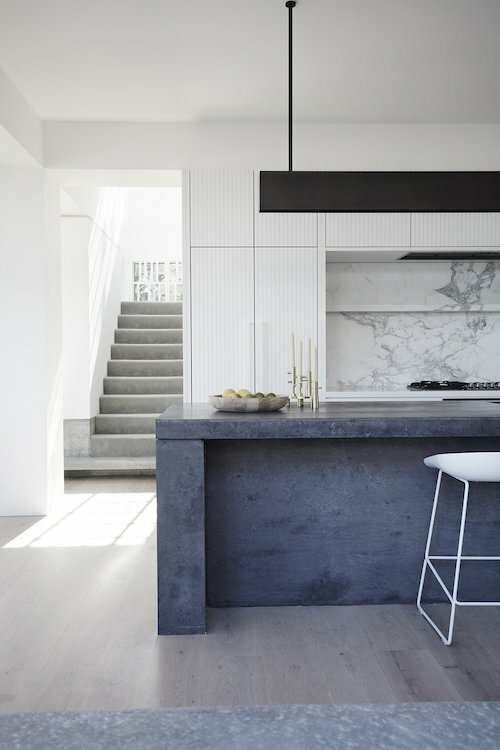 Cararra marble bench tops intersect the space and create a predominantly horizontal element to the kitchen. Black is used as an accent in this space. Daniel Raymond Architects has created this modern farm style kitchen. Elegant and bold, the kitchen shows off V-groove cabinetry contrasted with chunky bench tops and large featured door handles. The above kitchen uses very narrow V-groove joins with a super chunky bench top. The proportions are elegant and unique. This kitchen is designed by Rebecca Shnider. It is casual, comfortable and cosy. Demonstrated here again is the classic V groove cabinetry with a solid featured bench top. Timber has been used in classic kitchen designs for hundreds of years. It is the forefather of traditional materials. But timber can be used in a contemporary fashion too. Paired with white, tiles, marble, and grey, timber can add a classic element to a very cool looking space. The kitchens below show how timber can be used in a contemporary version of the farm-style kitchen. 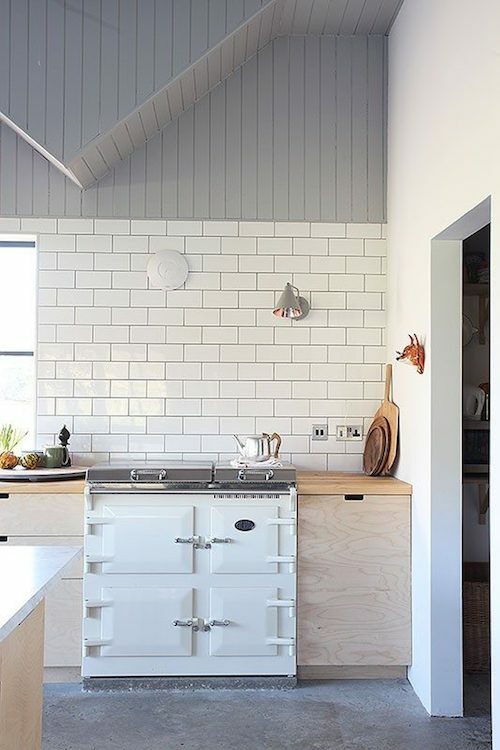 This kitchen sits in a converted farmhouse in Kent, England. 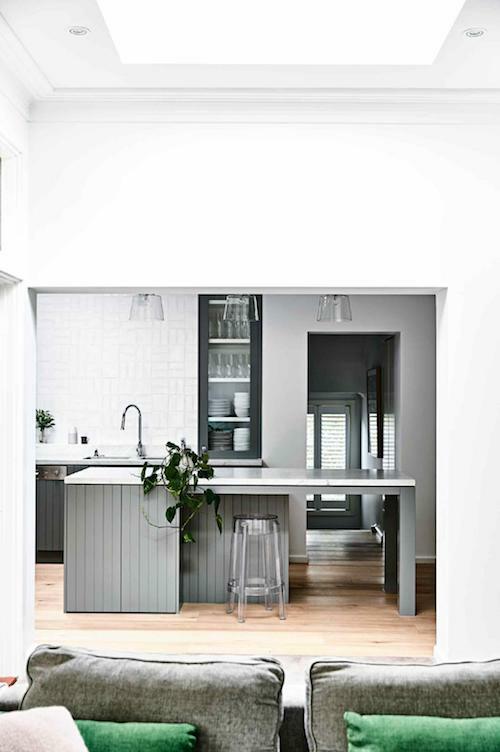 Birch plywood cabinetry is contrasted with white subway tiles, and cheeky grey ceiling that comes down to meet the splashback completes the look. The designer has opted for a very fresh approach with materials here. A V-groove panelled timber island is matched with a shiny white square tiled walls. 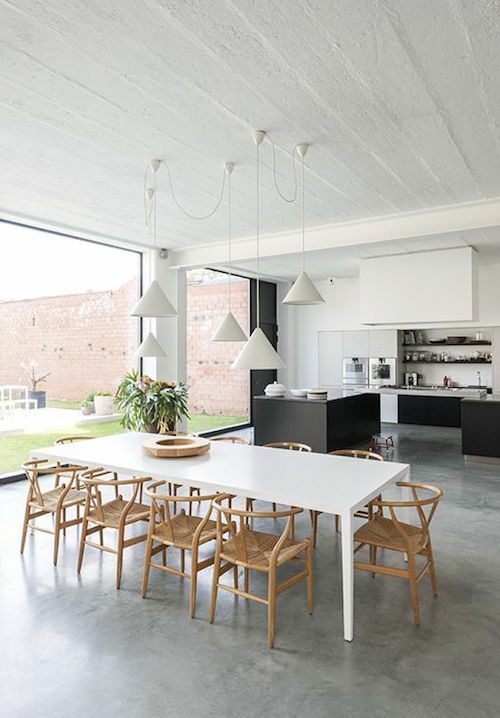 Concrete floors are accented by black walls. The timber adds warmth to a contemporary space, and the traditional materials of tiles and timber are used in a wonderfully new approach. Designed by Kate Marker, this kitchen is at once rustic as it is sophisticated. Classic fittings are mixed with Asian inspired furniture. 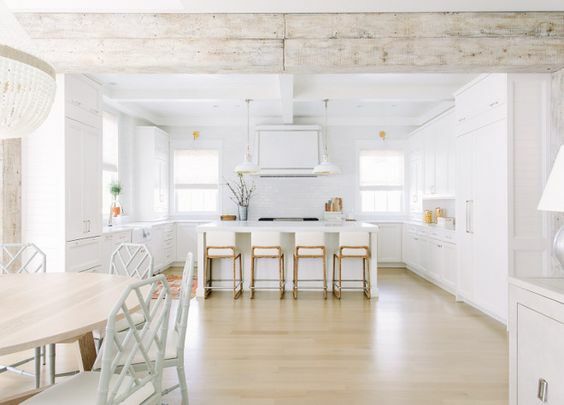 Timber beams extend into the kitchen cabinetry adding warmth and substance to the space. The white kitchen, minimal in its approach, is classic and timeless, and the introduction of marble adds warmth and glamour. A modern farm-style kitchen infuses historical elements of the past with the clean lines of today’s kitchens. Another approach to design here it to keep the cabinetry quite clean and flat, and introduce texture via the ceiling and floors. 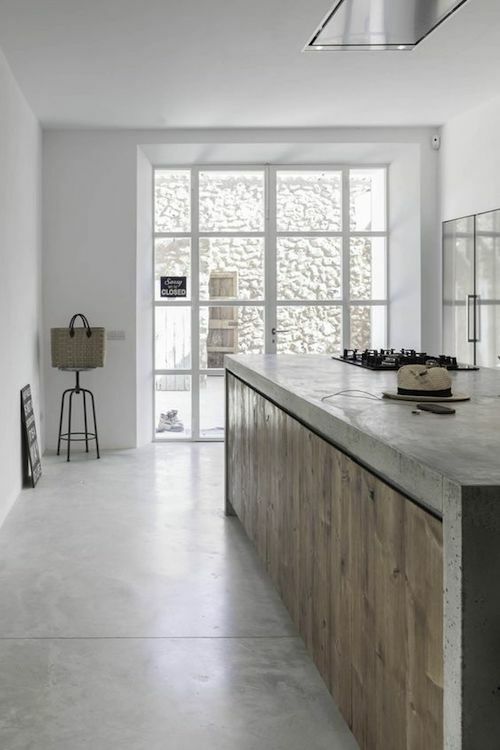 A concrete floor is modern and crisp and earthy. Paired with a ceiling that is textured, the finished space creates both a cosy and modern atmosphere. The kitchen above shows a home that has been restored in a traditional farm barn. The raised pitch ceilings are clad in beaded panels. The concrete floor is expansive and fresh. 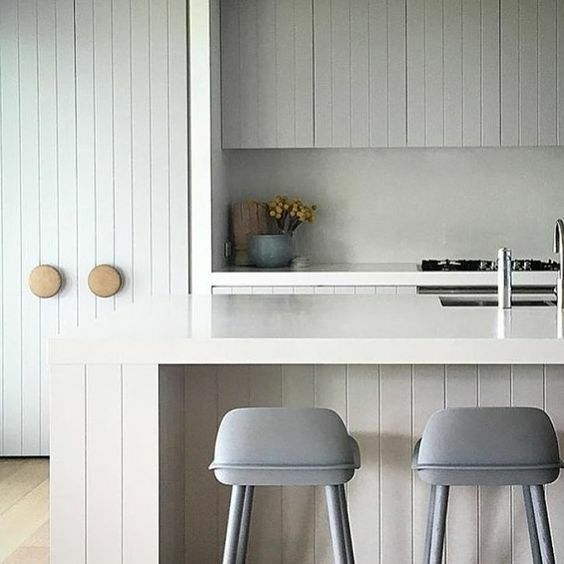 The cabinetry is kept minimal and streamlined, with a timber bench top to add warmth and depth. The above kitchen has an open plan space and expansive concrete floors. The kitchen is again minimal and decluttered. The concrete formed textural ceilings add warmth to the space which may otherwise be quite cold. This house in Mallorca Spain filters the soft Mediterranean light which is reflected on the concrete floors. The ceiling is flat, but added warmth and texture is introduced in the cobbled garden wall made visible through large doors. A white kitchen is always a popular choice for kitchen renovations. 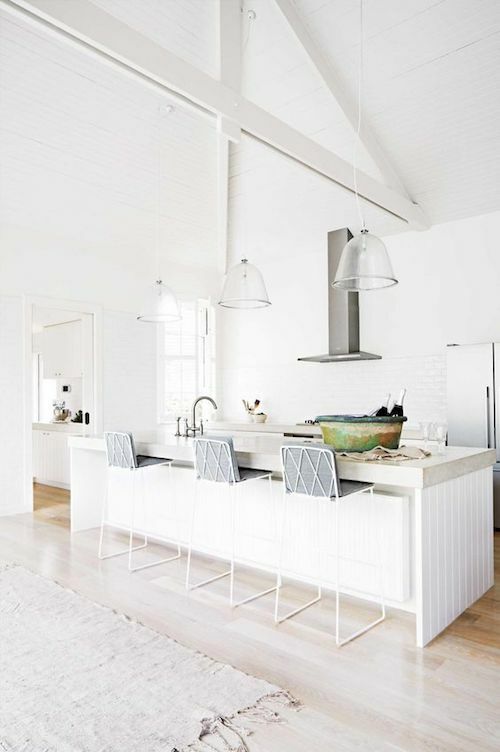 White kitchens are well-liked and make a space look spacious, clean and fresh. 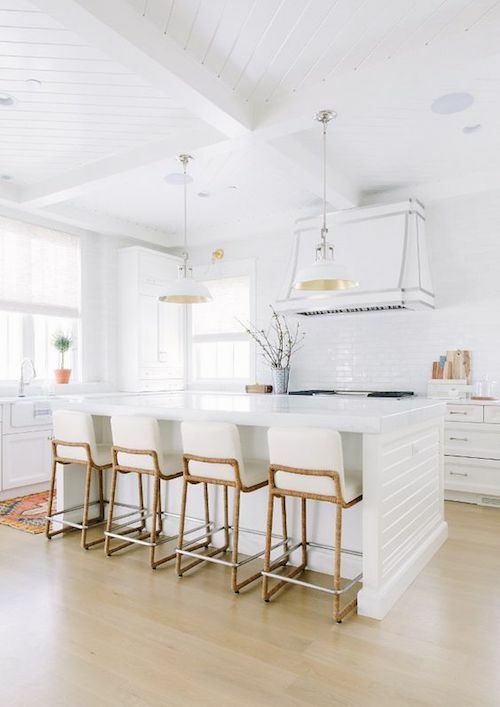 A modern farm-style kitchen in all white is contemporary and chic; the key is keeping it as white as possible and adding subtle texture throughout the space. The above kitchen is designed by the American designer Kate Marker. Her style embodies the modern farm-style approach to perfection. Her designs are at once elegant, contemporary, cosy, and liveable. Expansive, warm, and fresh her attention to detail is impeccable. Light fittings and appliances are classic. Caned, colonial furniture is lightweight and airy. The cabinetry, tiled splashback, and walls are of the same brilliant white which makes the space sparkle. The above kitchen uses white to emphasise the height and space of this kitchen. 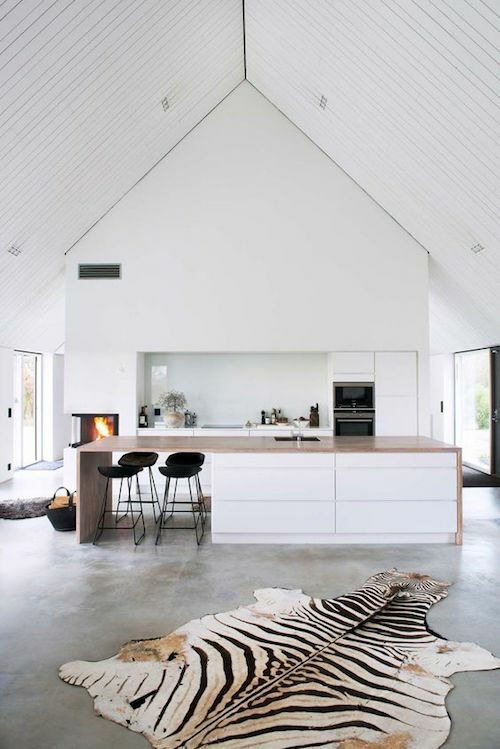 The kitchen seems to be seamlessly integrated into this open planned barn-style space. White cabinetry, a tiled splash back and walls are matching to integrate the space. Glass pendants keep the space transparent and fresh with V-groove detailing being applied to the cabinetry. Outlined above are four different ways to create a modern farm-style kitchen. The approaches are different, but the outcome is similar; to create a space that is minimal and decluttered yet warm and cosy, and pays reference to our past. 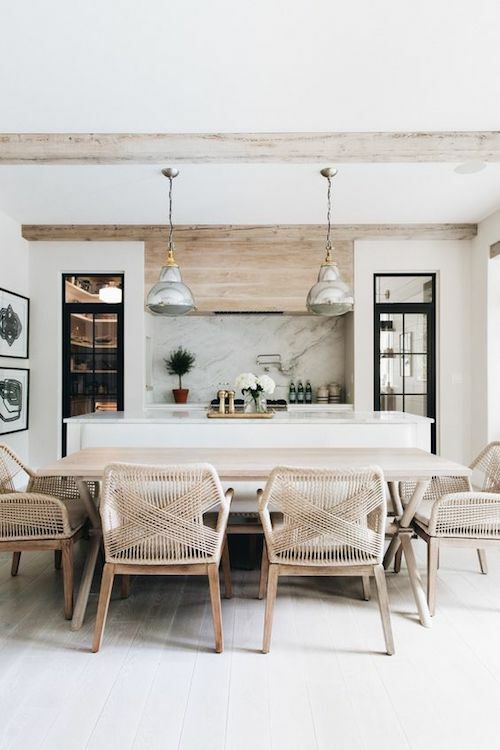 It in a fast-moving world, having a kitchen and living space that is both inviting and contemporary is a grounding and welcoming space to call home. What is going on with grey, grey, more grey, black, a little wood, concrete, white, grey? I would rather be left outside than live with this, and I am seeing it everywhere! Crate and Barrel, all the books – there’s no sky, no garden, – it reminds me of the late 70’s when everyone was “cocooning” and NOT in a good way. Thanks for your thoughts, I agree it would be super to see the garden from the kitchen, but it’s not always possible. I have designed over 2000 kitchens and from my experience no two people ever want the exact same kitchen, and lucky for that! 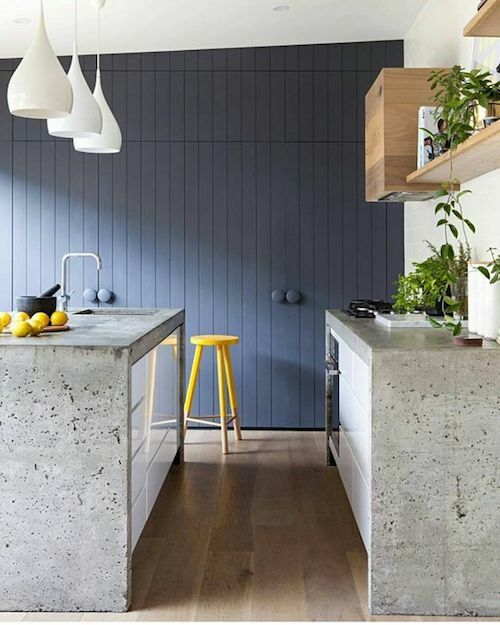 I love the look of several of these kitchens- particularly the one with the chunky blue bench-top (what material is that?) and the one with the “Asian inspired” chairs! Thanks for your comments, the chunky bench top is concrete formed on site, it’s great isn’t it! Love the last one! Clean, open space and lots of bright whites! Hi Sara, yes so bright and white! nice and inspiring kitchen designs..